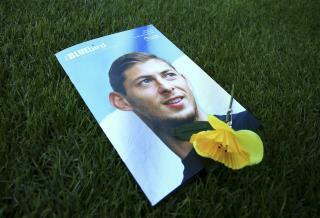 (Newser) – Britain's Air Accidents Investigation Branch says a body has been retrieved from the wreckage of the plane that crashed in the English Channel with soccer star Emiliano Sala on board. The AAIB, which retrieved the body with a remotely operated underwater vehicle, has not said whether the body is that of the 28-year-old player or pilot David Ibbotson, the Guardian reports. The AAIB says poor weather conditions made it impossible to retrieve any wreckage—and with the weather in the area looking rough for the foreseeable future, "the difficult decision was taken to bring the overall operation to a close." Haul him in the gurney to the beach. He'll pop back up and get into the game. Nantes FC has already been demanding Sala's $19.35 million transfer fee? Further evidence that the French are nothing but azzholes.